She became engaged to Pietro Molla and was radiant with joy and happiness during the time of their engagement, for which she thanked and praised the Lord. They were married on September 24, 1955, in the Basilica of St. Martin in Magenta, and she became a happy wife. In November 1956, to her great joy, she became the mother of Pierluigi, in December 1957 of Mariolina; in July 1959 of Laura. With simplicity and balance she harmonized the demands of mother, wife, doctor and her passion for life. 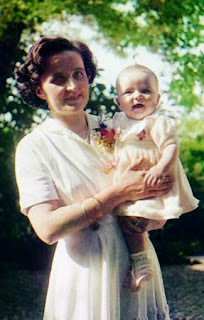 “Conscious immolation," was the phrase used by Pope Paul VI to define the act of Blessed Gianna, remembering her at the Sunday Angelus of September 23, 1973, as: “A young mother from the diocese of Milan, who, to give life to her daughter, sacrificed her own, with conscious immolation”. The Holy Father in these words clearly refers to Christ on Calvary and in the Eucharist. At her canonization in 2004, the great saint-maker said that St Gianna "was a simple, but more than ever, significant messenger of divine love. In a letter to her future husband a few days before their marriage, she wrote: "Love is the most beautiful sentiment the Lord has put into the soul of men and women". While Gianna enjoys considerable popularity in the trenches on this side of the Pond, her feast hasn't been placed on the local calendars in North America... at least, not yet. Even at a young age, Catherine sensed the troubled society around her and wanted to help. She dreamed of dressing up like a man to become a Dominican friar; more than once she ran into the street to kiss the ground where Dominicans walked. Catherine's parents tried hard to discourage her from becoming religious, but eventually, when she was about sixteen-years-old, Catherine, with the help of the Holy Spirit, was permitted to enter the sisters of Penance of St Dominic, the Mantellate. Her bold letters, even today, have a way of shocking the reader into reality. The style of her letters was lean and direct. She sometimes broke with polite convention. For example, during the Great Western Schism, in defense of Pope Urban VI, she rebuked three Italian cardinals who were supporting the anti-pope, writing to them, "what made you do this? You are flowers who shed no perfume, but stench that makes the whole world reek." These words are strong, and it is not recommended that we imitate them. St. Catherine had a unique call from God, which Pope Paul VI referred to as her "charism of exhortation." 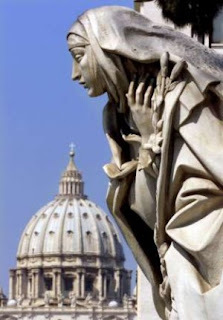 3 it was her great love and fidelity to the Pope and college of bishops that prompted her to respond to God's urgings that she be forthright with those who were against the Vicar of Christ. Wanting Pope Gregory XI to leave his residency in Avignon and return to Rome, and knowing the Supreme Pontiff was afraid of being poisoned, Catherine wrote to him, "Be not a timorous child, but manly . . ." She spoke to him as a loving daughter would. In other parts of her letters to the Popes she used an affectionate pet name for them: Babbo, which means Daddy. To Giovanna, the Queen of Naples, who supported the anti-pope and was accused of murdering her husband, St. Catherine wrote, "You know that you do ill, but like a sick and passionate woman, you let yourself be guided by your passions." Catherine risked death by sending such words to the authorities of her time. But she was not afraid. "I trust in the Lord Jesus Christ, not in myself" was one of her favorite prayers. In 1970, along with Teresa of Avila, Paul VI broke precedent by making Catherine the first woman to be given the accolade "Doctor of the Church." "What did she understand by renewal and reform of the church?" Papa Montini asked in conferring the title. "Certainly not the subversion of its essential structures, rebellion against pastors, a way of liberty and personal charism, arbitrary innovations in worship and discipline-as some would wish in our day. "To the contrary," Paul noted, "she repeatedly affirms [the desire] that the church retain the beauty of the Bride of Christ and that renewal could only come 'not with war, but peace and serenity, with humility and the ongoing prayer, sweat and tears of the servants of God.'" On a related note, completing the troika, the aforementioned diaries of Dorothy Day have hit the shelves.